Little Miss Moneybags: Book Review: Try! Decide! & Attitude! I was recently given the opportunity to review the books Try!, Decide! and Attitude! by Karen Okulicz. These three little motivational books were written to help people who are unemployed (Try! ), having trouble making a decision (Decide!) and struggling with being happy (Attitude!). Try! was born out of the author's two bouts of unemployment in three years - something a lot of people are facing in this economy. This is not a practical guide to writing resumes and interviewing, but instead a motivational missive from someone who's been there. 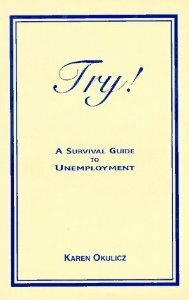 I was confused by the title at first, but it's not telling unemployed people to try harder like I thought at first - it's encouraging them to try different things, to keep trying even when they are discouraged and frustrated, and worn out. Attitude! centers on how to live your best life by learning what you can and can't control. My favorite quote from this book is "You cannot outthink crazy!" and the corollary, "Don't wear crazy shoes! ", meaning don't let someone's crazy behavior get to you by reflecting or reacting to their behavior - just set your own boundaries and do your own thing. 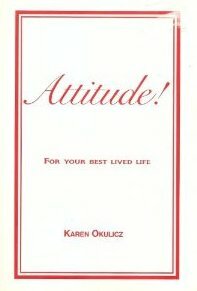 Many of the sayings in Attitude! could be found on motivational posters in your high school guidance counselor's office - these are things that are common sense, but as we all know, common sense is not necessarily so common. Decide! 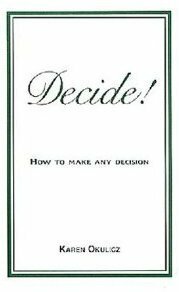 is a guide for making decisions in any area of your life. My takeaway from this was the third chapter, "One question and one question only," which says to ask yourself a single question, and ask it so the answer can only be yes or no. (From experience, I know that there's really only one question at the bottom of any decision, and that question is "What will make me happier?" So when looking at any potential decision, I can ask "Will this choice make me happiest out of all my choices? ", which is a much simpler question to answer than "Will this make me happy?") I like "policies" like this, which simplify my life and give me easy guidelines to fall back on. All three books reminded me a little of the way FlyLady writes in her book Sink Reflections, especially the first edition. Try!, Decide! and Attitude! are simple motivational guides written in a friendly and down-to-earth manner. My thanks to the author for sending me free copies to review. I was not obligated to review them, nor was I compensated in any other way. Do you have any motivational tips for being unemployed, for being surrounded by crazies, or for making decisions? If so, I'd love to hear them!